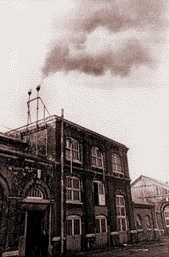 Saturday 25 March, 2011 was the 25th anniversary of the closing of the Railway Workshops in Swindon. Over night 1,100 workers were out of work, and 143 years of railway history came to an end. No more would the works hooter mark the time throughout the town, no-one would be going back “inside” again. It seems to be a little marked date on the internet, the “Mayor’s Memories 25 Years On” on SwindonWeb is the best that I have seen so far. There were also two little mentions on the Swindon Advertiser website: “The day the hooter sounded for the final time” and “Send us your memories of the railway works”. I guess there is little to celebrate, but it is worth commemorating. 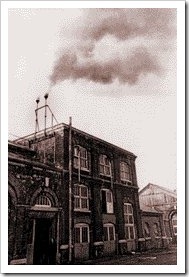 Swindon Railway Workshop – Gone With Regret. 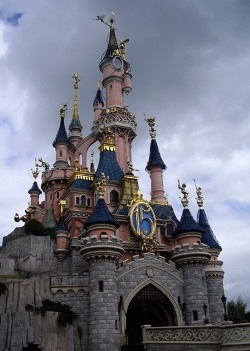 …Walt Disney World [^], in Florida. Is it just me or is everyone else wondering why? I thought that the twinned towns [^] were supposed to have some similarities. It’s hard to see the connection between a American tourist attraction and the former railway town. It seems that the link is a poem by Rebecca Warren [^] comparing the Magic Roundabout [^] with the Disney’s spinning teacup ride. To further confuse newcomers the roundabout complex will feature a sign proclaiming the twinning with the Magic Kingdom. I have just read a blog post with a lovely photo of the Radnor Street Cemetery, in Swindon [^], that brought make a few memories. 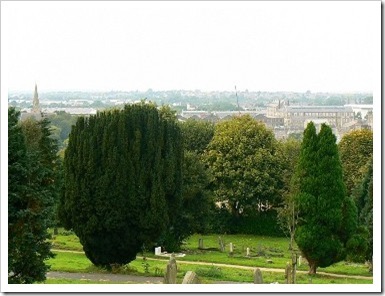 This is a photo of the cemetery that I found, available for public use under the Attribution, Share Alike Creative Commons Licence by Brian Robert Marshall, showing what a good view the cemetery offers of the town centre. Image Credit: Brian Robert Marshall, under this CC Licence. For a while, the Radnor Str Cemetery was one of our regular detours on the way home from school, back when free-ranging kids were the norm [^] rather than the exception. I don’t know why we went through here, it was definitely an out of the way route compared to the our usual walk down Clifton Street. I think that it was a bit of a thrill, all those creepy gravestones, and the risk of being locked in. And for some reason I can only remember going through there in the winter months, probably for the extra creepiness! But then again perhaps that is just my memory playing tricks on me. Thank you June for the story, the Hidden Swindon blog [^], and for bringing back this almost forgotten memory. More information can be found on the Blunsdon Parish Council webpage about the cemetery [^], and there are more black & white photos [^] on the BBC Wiltshire site. 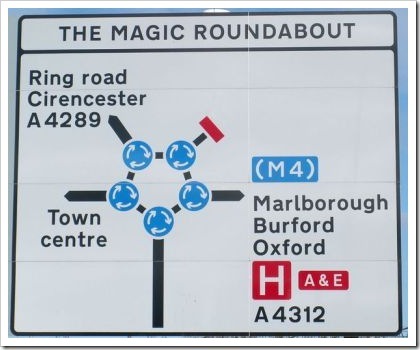 This is probably one of the most sensible things that I have read about roundabouts. Hurtling through a roundabout without regard to other road-users, or not indicating, is not just bad manners it is downright dangerous. This is another case of the Golden Rule coming into play; do unto others as you would have them do unto you. Grumpy goes on to single out BMW drivers as being prime culprits in the "this is my road" mentality. There is only one thing that I would like to add to the discussion – Mercedes drivers are as bad, if not worse! It has been said that Time heals all wound. With that in mind, it is easy to look back on the events of past with a certain degree of nostalgia or romanticism. The Great Western Railway (GWR) was an organisation that demanded staff loyalty, and for the most part earned the grudging respect of their servants. Tim Bryan manages to avoid romanticism in this survey of some the jobs people were employed in by the company. The diversity of the roles in the various operational areas of the Great Western are truly amazing – from manufacturing to clearance diving. These were the days when occupational health and safety were in their infancy; death or permanent disability at work was a very real possibility. It wasn’t without reason that the Railway’s Workshops at Swindon was one of the best prosthetic makers in the country. 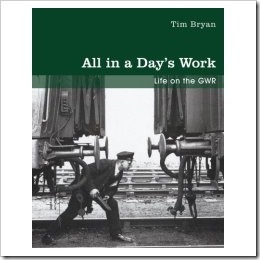 "All in a Day’s Work" doesn’t just concentrate on the glamour of the footplate, the place that every young boy wanted to work, and possibly the highest status blue collar job of the time. Being an engine driver may have been a top job, but it came after a hell of an apprenticeship – at least five years as an cleaner and a minimum of ten years working as a fireman. Once a fireman had made it on the "Top Link" it was back to the shunting links as driver. I can’t say that this is no-hold’s barred view, but it does give us some idea of the day-to-day pressures of life on the GWR.